The art intervention was produced when the Rue Peel entrance to Mount Royal Park was refurbished. It marked the 40th anniversary of John Lennon and Yoko Ono’s bed-in in Montréal, during which the song “Give Peace a Chance” was recorded. The artwork borders one of the curves in the path leading to Olmsted Road. On the path side, it is defined by two rocks symbolizing the mountain; on the east, by vegetation. 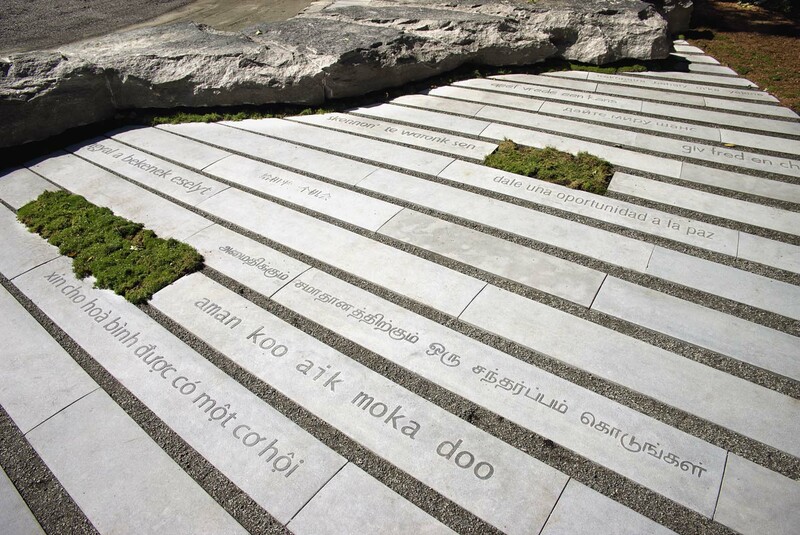 In an arch on the ground are 180 rectangular limestone flagstones, on 40 of which are engraved the sentence “Give peace a chance” in 40 languages. The artwork, produced jointly by the artist Linda Covit and the landscape architect Marie-Claude Séguin of Cardinal Hardy et associés, is a symbol of peace and a reflection of the social diversity that has been built in Montréal over the centuries. 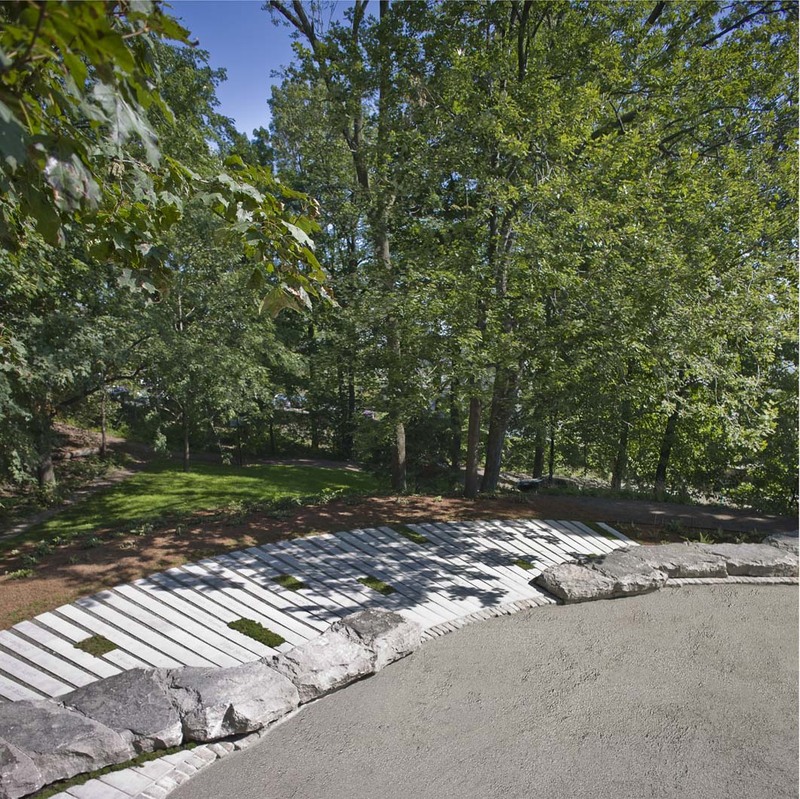 The installation integrates engraved elements and plant components that create a space inviting reflection, in harmony with the vision of Frederick Law Olmsted (1822–1903), the landscape architect who designed Mount Royal Park. The 40 languages are Algonquin, Arab, Armenian, Bengali, Creole, Croat, Danish, Dutch, English, English Braille, French, French Braille, German, Greek, Hebrew, Hindi, Hungarian, Huron-Wendat, Italian, Japanese, Khmer, Korean, Malagasy, Mandarin, Mohawk, Persian, Polish, Portuguese, Punjabi, Romanian, Russian, Serbian, Spanish, Swahili, Tamil Tagalog, Turkish, Ukrainian, Urdu, Vietnamese, and Yiddish. Singer John Lennon and his wife, Yoko Ono, checked in to the Queen Elizabeth Hotel in Montreal on 26 May 1969. Having held a “bed-in for peace” in Amsterdam in March, they held a second one in the hotel’s suite 1742, which lasted eight days. On 1 June, 40 people joined the couple to record the song “Give Peace a Chance.” This invitation to the world was issued in the context of the Vietnam war (1954–75). Since 1975, Linda Covit has created numerous art interventions presented in Canada and abroad. Her artworks address issues of nature, the environment, and peace. Water Garden, integrated with the Water Centre building in Calgary, and Shangri La Stripe Room, at the Shangri La Botanical Gardens and Nature Center in Orange, Texas, are among her most recent creations. 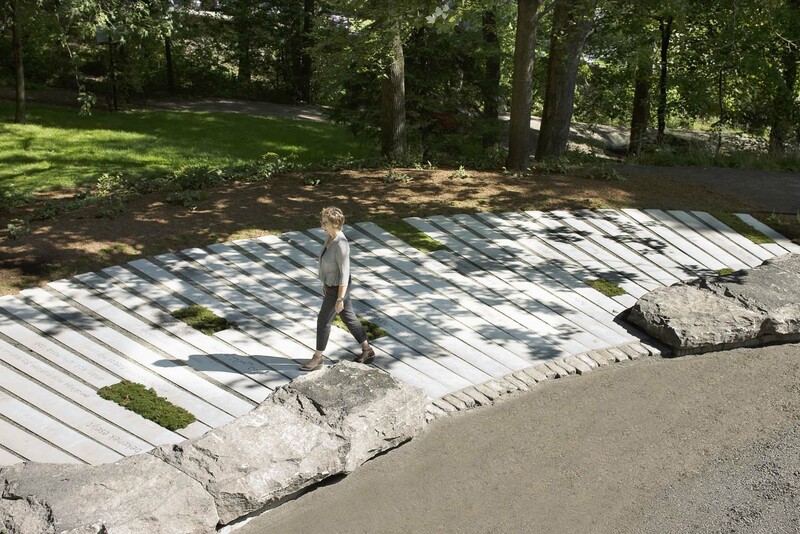 The landscape architect Marie-Claude Séguin is interested in the integration of public spaces in natural environments, particularly the highlighting of landscape characteristics in a partially urbanized natural context. Over the last 20 years, she has completed projects for Place d’Armes, Place Norman-Bethune, Dorchester Square, and Place D’Youville. She has received numerous awards for her work over the course of her career.